Description: Not a GE, but a Davenport! Description: US Army #1217 pulls a gon full of wet railfans during a rainy open house in jULY 1978. 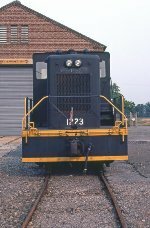 Description: US Army #1222 is seen during a rainy open house in July 1978. Description: a rare davenport 44 ton that still runs, although looks could be deceiving. this little baby is in the jefferson proving ground and belongs to the cmpa. Description: 44 ton built in 1953 by the Davenport Besler Corporation and donated to the Fort Wayne RR Historical Society in 1985. Description: USN 65-00556 at the NS Transportation Museum. Description: From the other side in the chaos of the shop.